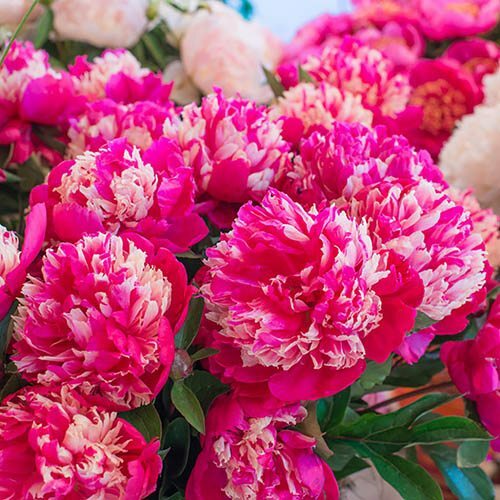 Decadent domes of raspberry-ripple blooms make this peony something special. A unique bi-coloured peony with fully double 6in domes of flowers in luscious cream and red and many shades in between! One of the most beautiful peonies for the home gardener, ‘Daydream' will sometimes sport other flower types such as white, single or semi-double and full, which can be quite exciting! The Exuberant, blousy blooms of gorgeous raspberry ripple are perfect for making up a hand-tied bouquet - they're currently bang on trend for wedding bouquets. Mature plants give a real focal point to a garden or even in a large pot, where your peony will happily repose for several years if kept fed and well-watered. Supplied as a bare root plant with no leaves, ready for planting out or potting on. One of the most beautiful peonies for the home gardener, ‘Daydream' grows to around 1m (36in) and unusually will sometimes sport other flower types such as white, single or semi-double and full, which can be quite exciting! The Exuberant, blousy blooms of raspberry ripple are perfect for making up a hand-tied bouquet - they're currently bang on trend for wedding bouquets and this decadent variety makes a superb addition to your home-made arrangements. When cut in bud, the blooms remain good for 5-6 days if kept cool and can last up to 2 weeks in a vase. Mature plants give a real focal point to a garden or even in a large pot, where your peony will happily repose for several years if kept fed and well-watered - although it will eventually need planting out as the roots can grow very large. Peonies can tolerate drought quite well but need abundant watering before flowering. Mulch lightly with well-rotted manure every spring - although not too deep as this will bury the crown. If you want really big flowers, de-bud the side shoots in April/May with a sharp knife. Remove spent flower stems after blooming to maintain an attractive plant all summer long.